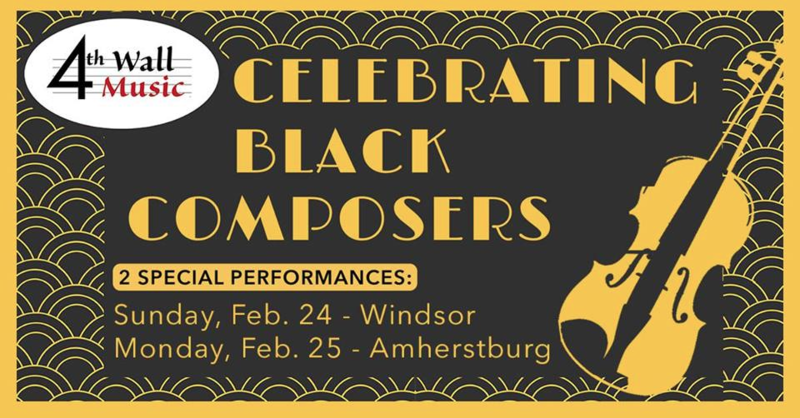 This enjoyment of of black composers will include classical, ragtime and gospel music. Irene Moore Davis discusses the influence of music on Windsor’s rich and diverse history. Join Detroit based violinist Velda Kelly along with Windsor pianist Mike Karloff and Soprano Shahida Nurullah to explore the fascinating lives and music of black composers from the 1700s to present including Joseph Boulogne, Le Chevalier de Saint George, William Grant Still, Shelton Brooks and Scott Joplin. Tickets available at www.4thwallmusic.com or at the door.